Researches say that 75% of the office workers have shifted their traditional desk to the height adjustable standing desk risers in the last one year due to the multiple health problems occurred especially in the workers who used to sit for an extended period at their seat. Today, we are going to look out one of the favorites and preferred standing desk converters by the most of the customer, “Halter ED-258 Standing Desk Riser” in detail. The product has been listed out in top websites and newspapers; you can get this product from popular shopping sites like Amazon, Intershoppy, and big box stores, the product is receiving some positive reviews and feedbacks from the customer who have used it. The reviews on the Halter ED-258 kindled me to know about the product in detail and checked out what makes the product so unique & special, I made a test, compared the product with another standing desk riser, and this review will explain what I found as a result. The Halter ED-258 was developed in China, and this is offered by the productive unit Super Deal, which is a subsidiary of the Dakota Trading Inc. The manufacturer is a New York based company and is operated in various website names for their each of the products. Proceed below to find out the features that make the product unique and attractive in detail. The manufacturer has used a double X lift design along with the up and down straight movement pattern which makes the lowering and raising easier. The desk can be controlled with the help of a tooth locking system and a lever, you need to press the handles to move the level, and now the teeth get disengaged which make the disk adjustment easier. There are dual gas cylinders which are small in size fitted at both the side of the base. You can take advantage of the handles located on the underside of the monitor to lower or raise the platform. If you are pressing the handles down, then you will be able to move the desk to the comfortable position, the unit gets locked once you release the handles. Infinite lock position is not found in the product technically, but the smaller spacing between the teeth makes the unit to function as they do have the feature. While considering the height options, I would say there is more freedom for you to choose the desired height when compared to Rocelco ADR or Varidesk Models. While considering the Ergonomics, the Halter ED-258 standing desk riser won’t be the perfect for all type of people, but you can add a monitor arm to make the ergonomics to a dual action. The good feature involved in this standing desk converter is that the lifting capacity allows you to add extra accessories like Monitor arm etc. without any weight limit approach, which is not found in most of the standing desk riser models. The range of adjustment also lacks in this desk converter; this Hatler ED-258 has a limited range of adjustment so that taller persons find difficulties in using the desk while standing or sitting. I love this feature in Halter Ed-258, the unit especially is made thick, but this is being the main reason for the product’s secure anchor point. The moving option of straight up and down action allows you to move away from when the desk is raised. The metal brackets indulged within the keyboard platform is considered to be the most stable option of this halter Ed-258 standing desk, which helps to remove any keyboard bouncing from the base easily. The rubber stoppers which is located on the keyboard tray underside come into contact with your base legs when the desk is lowered down making the keyboard to remain stable and therefore no chances for the front to back rocking or side to side wobble. The stability is achieved to the core when the product is at its highest height and in motion. This Halter ED-258 does not involve any wire management, there are also no adhesive back clip or built in system for attaching. There are two platforms namely monitor to be placed on the upper platform and mouse & keyboard to be positioned on the lower platform. While considering the upper platform, it indulges a large cut out at the front as seen in varidesk models. Therefore you can fit dual monitors with ease; you can also place additional accessories like catalogs, sticky notes, notebooks, etc. without any disturbance. In the lower platform, the keyboard tray is designed broad as the monitor platform; you can check out the cut out in the curved position on the front of the keyboard tray and additional space at the back of the lower platform. You can place any oversized mouse or keyboard as there is plenty of space available in the lower area, you can put any tablet, laptop, and other accessories at the back of the keyboard tray. 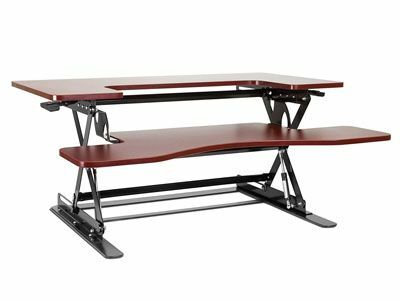 Why Prefer Halter Ed-258 Standing Desk Riser? I loved three essential features in this Halter ED-258 namely their affordable price option along with the high quality, the stability and the product’s ease of using. You can prefer to go with Halter standing desk converter just for this three option, and it’s rare to find all these three features to be positive in other standing desk converter models. Here are some of the product specification! Here are some of the advantage I have seen in this Halter product! Hope the above review on Halter ED-258 Standing Desk Riser provided the clear understanding on the product. Any ideas, thoughts, and query on the product are welcome! Have you found any other standing desk riser preferable than Halter ED-258 Standing Desk Converter?